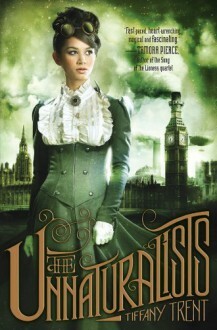 In an alternate London where magical creatures are called Unnaturals and preserved in a museum, two teens find themselves caught in a web of intrigue, deception, and danger.Vespa Nyx wants nothing more than to spend the rest of her life cataloging Unnatural creatures in her father’s museum, but as she gets older, the requirement to become a lady and find a husband is looming large. Syrus Reed’s Tinker family has always served and revered the Unnaturals from afar, but when his family is captured to be refinery slaves, he finds that his fate may be bound up with Vespa’s—and with the Unnaturals. As the danger grows, Vespa and Syrus find themselves in a tightening web of deception and intrigue. At stake may be the fate of New London—and the world.